Looking for a list of great books for your Kindergartner to read, here is a wonderful list of books for Kindergarten kids to read themselves. Just print the kid friendly library book list to take with you to the library. Here are some of the BEST books for Kindergarten age kids to read themselves. You can conveniently order them from Amazon using the links provided so your child to read over and over to achieve fluency. OR print the convenient library book marks below for an easy way to get the books free from your local library. Books are listed from easiest to hardest with the Book Level used by most libraries in parenthesis for your convenience. Books are listed from easiest to read to more advanced Kindergarten readers. 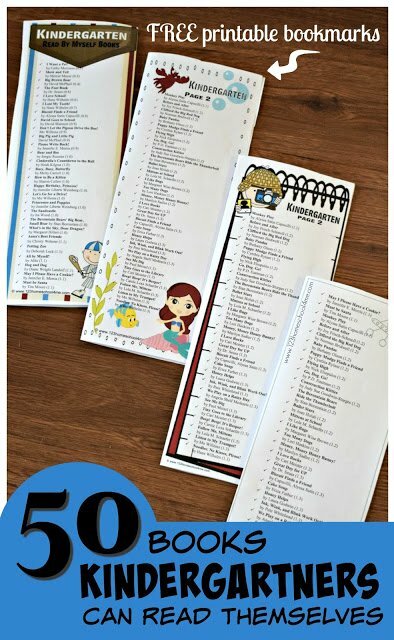 To make it east to find great books for your new reader I made a printable from this list. There are 10 different styles. The first 5 are in color. Just print, fold in half, and laminate to make a convenient bookmark they can bring along to the library. They can go through them in order and check them off with a dry erase marker when they’ve read a book. The next 5 are in black and white to save on printing costs or to allow your Kindergartner to personalize their list. You can either print it on cardstock and cut apart to make 2 seperate bookmarks (one with easier and the 2nd with more difficult books) OR you can print on plain paper and allow them to color it. Then fold in half and laminate. Use with a dry erase or sharpie marker to mark off books your child reads.